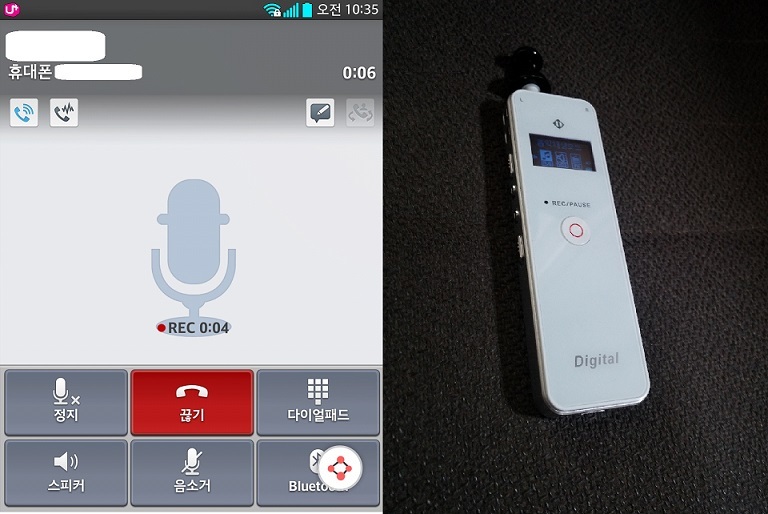 In Korea, it is legal to secretly record a conversation if you yourself are a party to it. Otherwise, it’s illegal (and a crime). The pertaining law is the Protection of Communications Secrets Act (통신비밀보호법). In particular, let’s take a look at Articles 3, 4, 14, and 17. 5. Monitoring radio waves for the elimination of interference, etc. : Where radio waves are monitored in order to maintain order in radio waves by, for example, eliminating interference under Articles 49 through 51 of the Radio Waves Act. (2) Any censorship of mail or any wiretapping of telecommunications (hereinafter referred to as “communication-restricting measures”) shall be used as a supplementary means of facilitating a criminal investigation or ensuring national security, and efforts shall be made to minimize the violation of people’s communication secrets. (3) No person shall provide or be provided with a serial number of any terminal apparatus: Provided, That this shall not apply where the enterprise for manufacturing the terminal apparatus of mobile telephone or the mobile communications business operator provides or is provided with a serial number for a performance of lawful business, such as the opening of a service for terminal apparatus, repairs, etc. Mail or its contents obtained through illegal inspection and the contents of communication acquired or recorded through illegal wiretapping in violation of Article 3 shall not be admitted as evidence in a trial or disciplinary procedure. (1) No person shall record a conversation between others that is not open to the public or listen to it through the employment of electronic or mechanical devices. (2) The provisions of Articles 4 through 8, 9 (1) (former part) and (3), 9-2, 11 (1), (3) and (4) and 12 shall apply to recording or listening as referred to in paragraph (1). 6. A person who has been provided with the communication confirmation data or provided such data in violation of the provisions of Article 13 (4). 4. A person who has failed to report the current status of the provision of communication confirmation data, etc. to the Minister of Science, Information and Communications Technology (ICT) and Future Planning or to keep relevant materials in violation of the provisions of Article 13 (7). As you can see, the law only prohibits secretly recording (and wiretapping, etc.) of conversations “between others.” This essentially means if you are a party to a conversation, you may lawfully record that conversation even w/o the consent of the other party or parties. This was affirmed by the Supreme Court of Korea. Basically, the Court ruled it is legal/lawful to secretly record a conversation even amongst 3 people if you yourself are a party to it. So, the bottom line is whether or not you were a party to the recorded conversation. Such secretly recorded conversations can even be used as evidence in court. 1) Employer-Employee: Making a complaint, giving a formal warning, being promised something/payment, etc. 2) Doctor-Patient: If the patient is being explained a particular surgery he/she will undergo, etc. 3) Lender-Lendee: Acknowledgement of a loan, promises to pay back, etc. 4) Landlord-Tenant: Making a complaint, putting the other party on notice, etc. 5) Criminal-Victim: When being harassed, threatened, blackmailed, etc.